Are You a Marshall County Firefighter? Rest In Peace Brother, We Will Take It From Here! The alarm sounded but we were one Brother short. He responded to a greater call. A Call From Above. A Call To Come Home. 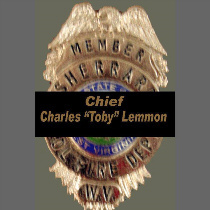 Charles William "Toby" Lemmon, Sr. of Glen Dale, WV, passed away on Thursday, August 13, 2015, at U.P.M.C., Pittsburgh, PA. He was born September 2, 1945, in Wheeling, WV, son of the late Bartelette C. and Ruth Shepherd Lemmon. "Toby" was a graduate of the former Triadelphia High School, Class of 1963, and was a U.S. Army Reserve Veteran. He was a retired sheet metal worker with Local 33, and a member of Our Lady of Peace Catholic Church. He was the first Fire Chief for the Sherrard Volunteer Fire Department since 1981 to present day. 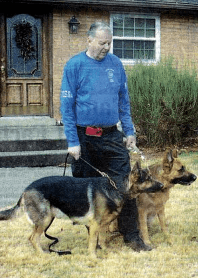 He was President of the Marshall County Fire Fighters Association; Team Leader of the Marshall County Search and Rescue along with many other Search and Rescue Teams throughout the community. He was a Fourth Degree Knights of Columbus Council 12195 at Our Lady of Peace; past member of Wheeling Eagles; and a lifetime member of the Lewis Wetzell Rifle Range. In addition to his parents, he was preceded in death by a sister- in-law, Joyce Riding, and a brother-in-law, Dan Morris, Sr. Surviving are his loving wife of 45 years, Cathy Dean Lemmon; three sons, Charles William Lemmon, Jr. and his wife, Gail of Glen Dale, Chris D. Lemmon and his wife, Stacie of Glen Dale, and Chad M. Lemmon and his wife, Michelle of Wheeling; a sister, Barbara Morris of Bellaire, OH; a brother, Louis Lemmon and his wife, Sonja Taylor of Clarington, OH; nine grandchildren, Madison and Braden Lemmon; Hunter and Spencer Nieto; Hallie, Hunter, and Ty Lemmon; Mason and Audrey Lemmon; several nieces and nephews; and his companions, his canines, Zeus and Zeb. In 2012 the Sherrard VFD was awarded a Regional Assistance To Firefighters Grant to replace our old Fire safety Trailer with a new state of the art one. Kenwood Selected at P-25 Radio Of Choice!